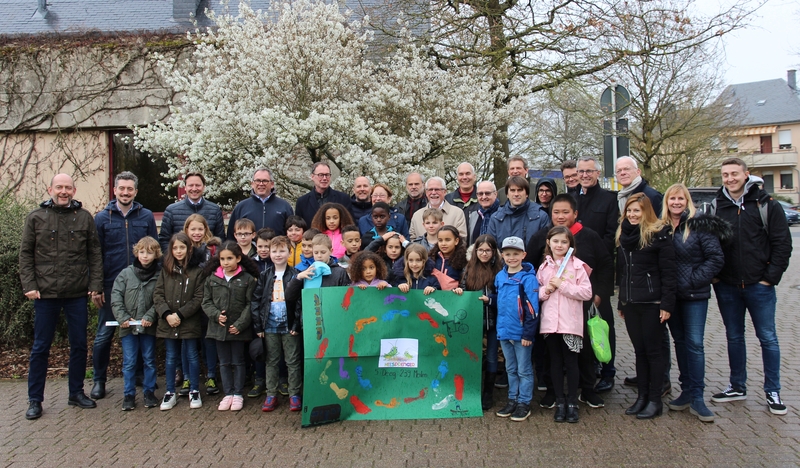 On 9 April 2019, this year's starting signal for the Europe-wide Green Footprint Campaign was given in Hesperange, Luxembourg: The board members of Climate Alliance symbolically sent some 20 children from the day-care centre "Hesper Heesprénger" (Hesperange Grasshoppers) with their scooters, bikes and inliners on their way to South America to collect Green Footprints for the global climate. Around 50,000 children from eight countries joined in so far. How about you/your city, school or day-care center? Are you collecting Green Footprints, too? Climate Alliance will be handing over them at the 25th UN Climate Conference in Santiago de Chile in December. Green Footprints that reach Climate Alliance by 8.11.2019 are guaranteed to be handed over in Chile. Today, a group of primary school children from Katowice presented their efforts on climate change along with their wishes for the future in a letter to the decision makers at the 24th UN Climate Summit. The pupils underline that their actions will be futile if they- the leaders- do not give them an example. 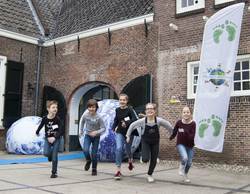 Over 1,200 schools spread across 9 European countries participated in the 2018 Green Footprints or ZOOM campaign. Together they collected some 2.2 million green footprints. 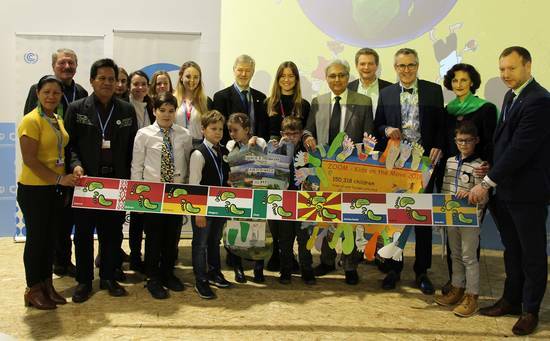 Andreas Wolter presented footprints carrying the expectations of participating children as well as those of municipal representatives to UNFCCC Deputy Executive Secretary Mr. Ovais Sarmad. The ZOOM encourages children to reflect on sustainable mobility and lifestyle choices. This year’s participants were the most active since the Paris Agreement, collecting even more green footprints per child for sustainable travel and behaviour in order to convince the decision makers in Katowice to draw up a strong action plan for our future as well. At 11:00 in the morning Climate Alliance and some ZOOM Kids from the School No.15 in Katowice will get the opportunity to hand over the Green Footprints collected from 150,000 children in 9 countries at the 24. UN Climate Summit, held in Katowice, Poland. The children will report on their climate activity week and present their Wishprints as well as their letter to the Climate politicians with their demands for climate action. Furtheron Climate Alliance will hand over the total results of Green Footprints collected in 2018 and ask to deliver the children's wishes and demands to the conference delegates to encourage them to really fight for ambitious results of this year's climate talks! Thousands of children already steped in again and many more from all over Europe will be joining in within the coming months. As part of Climate Alliance's campaign “ZOOM - Kids on the Move”, school and kindergarten children collect ‘green footprints’ for everyday routes that can be covered on foot, by scooter or bicycle, by bus or train in a climate-friendly manner. This year's “launch step” is at the same time as the interim negotiations on the UN Climate Process in Bonn. There the rule book on the Paris Climate Agreement will be drawn up, which hopefully can be adopted at the next UN Climate Summit in Katowice, Poland, in December. In Katowice the Climate Alliance will again present the Green Footprints of all children as well as their wishes and demands to the climate politicians in order to demonstrate how eager the children of Europe already contribute to the rulebook on municipal climate protection already. Today, a group of kindergartners from Bonn presented their efforts on climate change and their wishes for the future to decision makers at the 23rd UN Climate Summit. “Children can be great drivers of positive change. By motivating them to protect the climate, we see a ripple effect that really spreads – not only to their friends, families and their teachers,” explains Climate Alliance Executive Director Thomas Brose. Over 1,400 schools spread across European 10 countries participated in the 2017 Green Footprints or ZOOM campaign. Together they collected some 2.3 million green footprints. 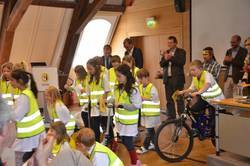 The initiative encourages children to reflect on sustainable mobility and lifestyle choices. At 10:30 in the morning Climate Alliance and ten ZOOM Kids from the kindergarten "Mach Mit!" in Bonn will get the opportunity to hand over the Green Footprints collected from 180,000 children in 10 countries to the UNFCCC Executive Secretary Patricia Espinosa at the 23. UN Climate Summit in Bonn. The children will tell her about their climate activity week and present her their Wishprints with their demands for climate action. Furtheron Climate Alliance will hand over the total results of Green Footprints collected in 2017 and ask Ms Espinosa to deliver the children's wishes and demands to the conference delegates and to call on them to continue the succuess Story of the Climate Summit in Paris with concret steps NOW! 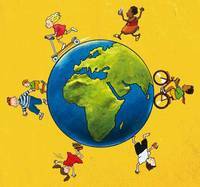 Children across Europe show climate commitment for 15th year running! 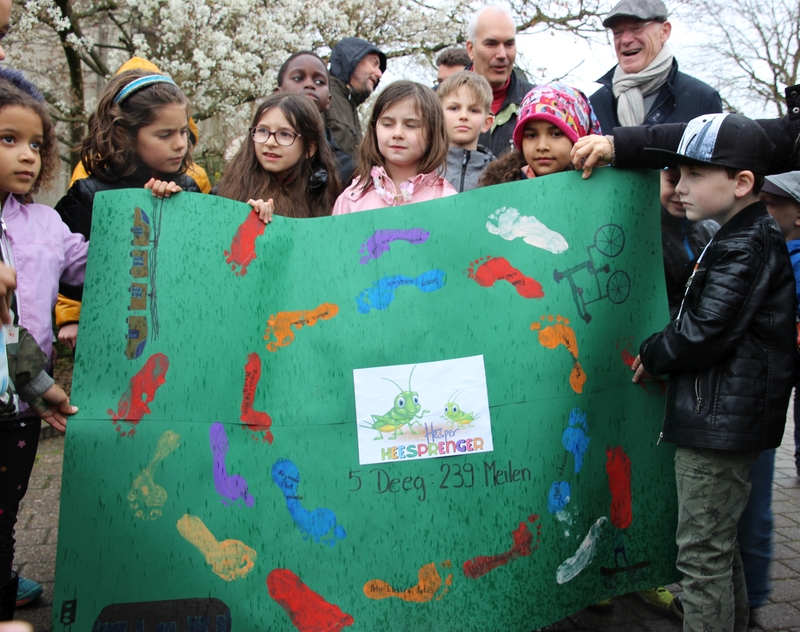 This Year for the 15th time in a row, children will collect Green Footprints across Europe. Since 2002, children have been helping to protect the global climate by every climate-friendly journey – on foot, by scooter or bike, bus or train. To celebrate the 15th anniversary of the ZOOM – Kids on the Move! campaign, Climate Alliance is holding a creative competition: children are invited to design their own version of the ZOOM – Kids on the Move! logo and to add their own ideas for climate protection. Climate Alliance will reward the children from the most creative group with a climate friendly present. In the last 15 years, 25 million Green Footprints were collected by nearly two million children in 35 countries. In 2017 tens of thousands of children in kindergartens and schools will once again be on the move and collect Green Footprints to help protect the global climate. In November, Climate Alliance will hand over the Green Footprints collected as well as the most creative results of the creative competition to politicians during the 23rd UN Climate Change Conference in Bonn. Since 2002, children have phrased their wishes for climate protection and have called on the participants in the UN Climate Change Conference to support them with concrete measures and to define and implement specific national and international goals. Thomas Brose, Executive Director of Climate Alliance, accentuates the successful work with the participating municipalities and educational institutions: “For 15 years children have shown us that you can make a difference in climate protection by starting with yourself and working as one. I´m looking forward to presenting their commitment at the UN Climate Change Conference in Bonn this year”. The campaign has evolved over the years, this year Climate Alliance has updated the accompanying teaching guide. The organization has also added new implementation and game ideas, break time games and worksheets. In addition the subjects of climate justice, consumption and sufficiency are covered in greater depth. The ZOOM – Kids on the Move! campaign opens up new insights to the world to children at a young age. It introduces the subjects of climate change, sustainability and globalization. 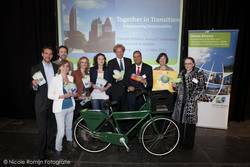 Climate Alliance will continue to attract new participants as well as motivate already participating municipalities. Participation for 2017 is possible until October. Marrakech / Frankfurt, 14 November 2016. Climate action shouldn’t only be left to the grown-ups. Today, Climate Alliance presented the climate protection efforts of 174,624 children spread over 10 countries to UN Climate Secretariat Executive Secretary Patricia Espinosa. 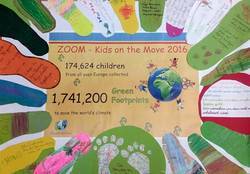 The children earned a total of 1,741,200 “green footprints” within the framework of Climate Alliance’s ZOOM campaign by making climate-friendly trips to school, saving energy in their classrooms, eating regional foods and choosing notebooks made with recycled paper. The handover of the footprints along with the children’s wishes and demands for the future took place during the 22nd Climate Summit currently being held in Marrakech. Especially prominent this year amongst the children’s demands was the recognition of a need for action. The children asked UN Climate Conference participants to bring the Paris Agreement to life through their policies. Messages sent by many of the older children also highlighted the understanding that they will have to pay for today’s weak regulations, as will their own children in the future. Hafner-Auinger, in the company of UN Youth Delegates and local as well as national representatives of participating ZOOM countries, invited Executive Secretary Espinosa to deliver these important messages to the delegates of the conference. Climate Alliance’s ZOOM – Kids on the Move campaign has been helping children learn about sustainability and the climate since 2002 during special activity weeks throughout the school year. Through the campaign, which is open to interested educational facilities in Europe and beyond, children send messages to their communities, work with their teachers to contact their local politicians and express their hopes to international leaders at the annual UN Climate Summits. This year, children from Austria, Belarus, Czech Republic, Germany, Hungary, Italy, Luxembourg, Netherlands, Poland, Romania and Sweden called upon politicians at all levels to serve as better role models for climate action. Their “wishprints” for the climate politicians were filled with demands and hopes such as, "I want all food to come by sailboat, because they run on the wind and that does not make any emissions," "Please make sure there are less exhaust fumes," "We need plants - they make oxygen for us," and "Everybody should be happy. Everybody should have a good life.” The clear message for legislators: Act now to save our climate! At 10:20 in the morning Climate Alliance will get the opportunity to hand over the Green Footprints collected from 175,000 children in 10 countries to the new UNFCCC Executive Secretary Patricia Espinosa at the 22. UN Climate Summit in Marrakech. She will be asked to deliver the children's wishes and demands to the conference delegates and to call on them to continue the succuess Story of the Climate Summit in Paris! Bad Berneck/Frankfurt am Main, 11 April 2016. 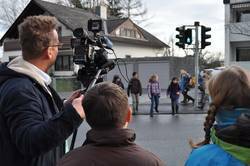 The first steps for this year’s European-wide ZOOM campaign have been taken by children from Bad Berneck’s Sebastian Kneipp School, thereby kicking-off the 2016 season. Thus far, children in eight EU countries will be participating in Zoom for 2016; more are sure to follow. The campaign engages children in sustainable mobility in a playful way, encouraging them to earn special “Green Footprints” for each climate-friendly trip they make. “We have supported the ZOOM campaign for 10 years now and are therefore thrilled to be hosting the European-wide kick-off for this year,” pronounced Deputy District Administrator Christa Reinert-Heinz in her opening speech. “In this way, the commitment of the children in this city and district receives special recognition.” Katharina John, Headmistress of Sebastian Kneipp School, went on to describe how eager the children always are to participate in the campaign, which so successfully combines awareness-raising with old-fashioned fun. 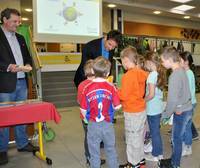 The festivities were marked by Martin Stümpfig, Member of Bavarian Parliament, and Jürgen Zinnert, Mayor of Bad Berneck, who encouraged the children to continue their exemplary activities. Since 2002, young children across Europe have participated in this annual climate action campaign by the Climate Alliance. ZOOM places grassroots measures above slow negotiation processes. Children demonstrate to their parents and politicians alike that action is needed instead of empty promises. In so doing, they show that they are part of the solution to our common climate challenge. 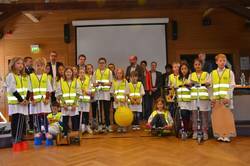 Tens of thousands of children in kindergartens and schools across Austria, Belgium, the Czech Republic, Germany, Hungary, Italy, Luxembourg and the Netherlands will be “ZOOMing” in for sustainable mobility and collecting footprints for their actions in 2016. The city and district of Bayreuth has been implementing the campaign for a decade, supporting ZOOM with intensive communications work and rewarding the participants with prizes each year. In 2002, Climate Alliance started the mobility campaign for children, extending it to the whole of Europe in 2003 under the motto “ZOOM – Kids on the Move for Climate Action”. Since then, 1.7 million children from 39 countries have participated, more than 185,000 last year alone. Together over the years, they have collected over 22 million “Green Footprints”. For more than 25 years, Climate Alliance member municipalities have been acting in partnership with indigenous rainforest peoples for the benefit of the global climate. 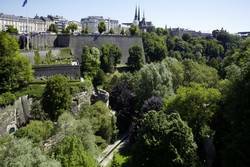 With over 1,700 members spread across 26 European countries, Climate Alliance is the world’s largest city network dedicated to climate action and the only one to set tangible targets: each member city, town and district has committed itself to reducing greenhouse gas emissions by 10 percent every 5 years. Recognising the impact our lifestyles can have on the world's most vulnerable people and places, Climate Alliance pairs local action with global responsibility. After the promising results of the last UN Climate Conference in Paris, Climate Alliance hopes that even more kids and teens in Europe ZOOM in to get Climate Action going! In 2016 the collected Green Footprints will be for our Climate Journey around the One World, ending at the UN Climate Conference in Marrakesh, Morocco. The 22nd UN Climate Summit will be held there from 7.-18.11.2016. Due to this, in 2016 Green Footprints can be only collected until 25 October. So ZOOM in soon and be on the Move for our One World's Climate! Carole Dieschbourg, Luxembourg Minister of Environment, in the company of UN Youth Delegates and representatives of participating ZOOM countries, personally presented the green footprints along with the children's concrete wishes and demands to Ms Figueres. In so doing, Dieschbourg asked Executive Secretary Figueres to deliver these messages to the delegates of the conference. Especially prominent this year amongst the children’s demands was a sense of urgency in asking the UN Climate Conference delegates in Paris to finally pass a strong agreement. Messages sent by many of the older children highlighted the understanding that they will have to pay for today’s weak regulations, as will their own children in the future. This year, children from Austria, Belarus, Belgium, Czech Republic, Germany, Greece, Hungary, Italy, Luxembourg, Netherlands, Romania, Sweden and Ukraine called upon politicians at all levels to better fulfil their function as role models by taking action on the climate. One poster made by a kindergarten class in Neumünster, Germany sums it up particularly well with the plea, “Dear Politicians, it’s in your hands. Please don’t destroy our beautiful earth.” With wishes, demands and comments such as, “please keep our rivers clean,” “I would like to have many healthy trees,” “only use your car for long distances,” “polar bears cannot lose their sea ice,” and “we are the future,” the children sent a simple but unified message to politicians: act now to save the climate. At 10:00 in the morning, within the official opening event of the 'Young and Future Generations Day', Climate Alliance will hand over the Green Footprints collected from over 180,000 children in 13 countries to UNFCCC Executive Secretary Christiana Figueres at the 21. UN Climate Summit in Paris. She will be asked to deliver the children's wishes and demands to the conference delegates and to call on them to adopt a strong agreement in the end! 28 April 2015, Luxembourg/Frankfurt. 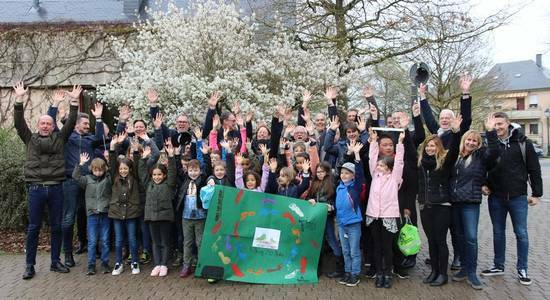 The first steps for this year’s Euopean-wide ZOOM campaign have been taken by children from Luxembourg’s Mamer School at Luxembourg’s 5th national Climate Day. Thus far, children in 11 EU countries will be participating in Zoom for 2015; more are sure to follow. The campaign engages children in sustainable mobility in a playful way, encouraging them to earn special “Green Footprints” for each climate-friendly trip they make. Thomas Brose, Executive Director of Climate Alliance called on the children not only to collect Green Footprints, but also to make “wishprints” with their suggestions and demands to climate politicians. These, along with the footprints collected across Europe in 2015, will be presented to the participants of the UN Climate Summit in December, reflective of the children of Europe’s hope for the international adoption of a new and strong climate convention. Eriberto Gualinga, an indigenous filmmaker from Sarayaku, Ecuador, was present as a special guest to also support the children. Gualinga, currently on a tour across the continent advising municipalities on the respectful treatment of our Mother Earth, affirmed, "We are grateful for the actions of you children, as they help to ensure that the oil in the rainforest can remain in the ground. We know that the Amazon is much more valuable than oil. For us, the forest is life. Its importance lies far beyond the money! " Since 2002, young children across Europe have participated in this annual climate action campaign by the Climate Alliance. ZOOM places grass-roots measures above unfruitful negotiations. Children demonstrate to their parents and politicians alike that action is needed instead of empty promises. In doing so, they show that they are part of the solution to our common climate challenge. Tens of thousands of children in kindergartens and schools in Austria, the Czech Republic, Germany, Hungary, Italy, Luxembourg, Poland, Macedonia, the Netherlands, Romania, Sweden and Ukraine will be “ZOOMing” in for sustainable mobility and collecting footprints for their actions in 2015. Also for 2015 Climate Alliance is looking for ZOOM Kids from all over Europe to join our climate journey around the One World and to collect Green Footprints for the next UN Climate Conference as this year nothing less than a new climate convention has to be agreed on. The 21st UN Climate Summit will be held from 30.11.-11.12. 2015 in Paris so Green Footprints can be collected until 15 November 2015. Luxembourg will play a special role in this important climate conference in December, as it, in the second half of the year, has the presidency EU Council and thus will be chief negotiator for the EU. Therefor we're very happy to make this year's "Step off" together with Climate Alliance/Klima-Bündnis Letzebuerg on 28 April during their national climate holiday. Support for this event we will get from the Minister for Education as well as from an Indigenous fighter from the rainforests of Ecuador - the filmmaker Eriberto Gualinga. ZOOM in again in 2015, be on the Move for our One World's Climate! On Wednesday, 3 December, Climate Alliance handed over 2.2 Million “Green Footprints” collected by 180,000 children in 11 countries to UNFCCC Executive Secretary Christiana Figueres in Lima, Peru. Since 2002 kids all over Europe are on the move together to save the One World's climate. This year 180,197 children in 11 European countries (Austria, Belgium, Czech Republic, Germany, Hungary, Italy, Macedonia, Malta, the Netherlands, Poland and Sweden) ZOOMed in and collected 2,218,867 “Green Footprints” by using sustainable means of transport for their daily journeys, by saving energy in their schools and kindergartens, by buying exercise books from recycled paper, and by eating regional food. In Lima Thomas Brose, Executive Director of Climate Alliance, handed over the Green Footprints together with the children's concrete wishes and demands to the UNFCCC Executive Secretary Christiana Figueres, asking her to pass these messages to the UN Climate Change Conference delegates. This year he was accompanies by Youth Delegates from several countries. How much the Green Footprint collectors demand a positive outcome of the negotiations now demonstrate their ‘Wishprints’* telling simple but clear messages to the climate politicians like ”We want you to be better role models.” or ”I want you to spend more money on Climate Protection than on bombs and weapons.” But also concrete requirements like ”Please mark more crosswalks so we can cross the street on ourselves.” and ”I want less packaging waste, e.g. for toys!” can be seen on them. At 15:30 local time, when most ZOOMers in Europe have been fallen asleep already but in Peru the afternoon sun is still up, Climate Alliance will hand over Green Footprints collected from 180,000 children in 11 countries to UNFCCC Executive Secretary Christiana Figueres at the Climate Summit in Lima. Despite or even by reason of the once again very disappointing results of the last UN Climate Conference in Warsaw, Climate Alliance calls on all kids and teens in Europe to ZOOM in again! In 2014 the collected Green Footprints will be for our climate journey to the UN Climate Conference in Lima, Peru. The 20th UN Climate Summit will be held in Lima, Peru from 1.-12.12. 2014 so this year Green Footprints can be collected until 15. November 2014. ZOOM in, be on the Move for our One World's Climate! On Saturday, 16 November, Climate Alliance together with Polish ZOOM participants handed over 2.2 Million “Green Footprints” collected by 160,000 children in 13 countries to UNFCCC Executive Secretary Christiana Figueres in Warsaw, Poland. Since 2002 kids all over Europe are on the move together to save the One World's climate. This year 162,981 children in 13 European countries (Austria, Belgium, Bulgaria, Czech Republic, Germany, Italy, Luxembourg, Macedonia, the Netherlands, Poland, Romania, Sweden, and Switzerland) ZOOMed in and collected 2,177,902 “Green Footprints” for example by using sustainable means of transport for their daily journeys, by saving energy in their schools and kindergartens, by buying exercise books from recycled paper, and by eating regional food. Thomas Brose, Executive Director of Climate Alliance, and seven ZOOM participants from the School Szkola Podstawowa nr 4 im. prof. W. Szafera in Elk, Poland, handed over the Green Footprints together with the children's concrete wishes and demands to the UNFCCC Executive Secretary Christiana Figueres, asking her to pass these messages to the UN Climate Conference delegates. Brose explained to Figueres: “The Green Footprints represent all the efforts and engagement of the ZOOM kids so far. Their ‘wishprints’*, are a strong call on the politicians here in Warsaw to develop an ambitious work package for our and especially the children’s future NOW!”. The pupils report to the workshop participants on what they and the children of Europe have already done for the protection of our One World. 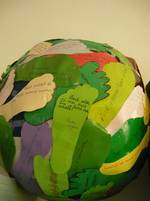 On Saturday, 16th November, Climate Alliance together with Polish pupils from Elk will hand over “Green Footprints” collected in 2013 to UNFCCC Executive Secretary Christiana Figueres at the Climate Summit in Warsaw. Far before sunrise a small group of Polish students from Elk in beautiful Masuria will make their way to Warsaw to be there at 9:00 o'clock in the morning to get ready for Registration. At 10:30 o'clock it will be time for the pupil’s Mini Side Event at the UNFCCC Climate Change Studio. There they will sing their school song, comprising a strong appeal to the adults to not destroy the children's future, and they will recite a poem with their wishes and demands directed at the Climate Politicians. Last but not least they will do an Air Boogie with the audience. Subsequently at 11:00 clock, Climate Alliance will hand over this year's ZOOM result to the head of the UN Climate Secretariat Christiana Figueres. Of course, the Polish children are included in this action too: They will ask Ms. Figueres to forward the wishes and demands of the 160,000 children from 13 countries to the participants of the UN Climate Conference and to bring the summit to a successful conclusion. But there is more to do for the children: after a short lunch break, the 10 students of the school Szko a Podstawowa No. 4 in Elk will have another appearance: the International Workshop 'Climate Dialogue - Promoting local Climate Mitigation'. There, at 13:30 o'clock, they will report to the workshop participants from many European municpalities, what the children of Europe have already done for the protection of the environment and our One World and of course they will present the Green Footprints collected in 2013. 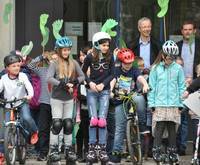 Since 2002 young children all over Europe are participating in Climate Alliance’s climate protection campaign “ZOOM – Kids on the Move for Climate Action”. Grassroots actions rather than unfruitful negotiations: the kids demonstrate to politicians and the adult public worldwide that they do not accept empty promises but contribute personally to climate protection by collecting Green Footprints eagerly. Despite or even by reason of the once again disappointing results of the last UN Climate Conference Climate Alliance calls on all kids and teens in Europe to ZOOM in again! As the United Nations Decade of Education for Sustainable Development (DESD) puts 2013 her main focus on mobility we hope to get some extra speed! ZOOM in, be on the Move for our One World's Cliamte! Attention: As the next UN Climate Conference starts at 11.11.2013 Green Footprints can only be collected until 26. October! On Saturday, 1 December, Climate Alliance handed over 2.5 Million “Green Footprints” collected by 160,000 children in 12 countries to UNFCCC Executive Secretary Christiana Figueres in Doha, Qatar. Since 2002 kids all over Europe are on the move together to save the One World's climate. This year 159,983 children in 12 European countries (Austria, Belgium, Czech Republic, Germany, Italy, Luxembourg, Macedonia, the Netherlands, Romania, Slovakia, Sweden, and Ukraine) ZOOMed in and collected 2,447,900 “Green Footprints” by using sustainable means of transport for their daily journeys, by saving energy in their schools and kindergartens, and by eating regional food. Due to urgent negotiations Ms Figueres had to cancle the handover today. It has been rescheduled to Saturday, 1. December, 16:45 Doha time. Climate Alliance will then hopefully be able to hand over this year's results to the UNFCCC Secretary Figueres at the UN Climat Summit in Doha, Qatar. The 160.000 participants in 12 European countries collected 2,447,900 Green Footprints, Grüne Meilen, Miglia Verde, Klimaschritte, Greng Meilen, Zelené Kilometry, etc. This year the ZOOMCampaign wants to pay regard to the 20th anniversary of the Agenda 21 and the "Earth Summit" in Rio de Janeiro in June. Therefore the young climate activists can collect extra green footprints for activities on the subject eco-fair and climate-clever school and kindergarten supplies. That means in addition to the fun of mobility on everyday journeys the children are asked to have a closer look at the things they are carrying in their rucksacks and schoolbags as well as the materials they use for writing, drawing, painting and other art work. Further information as well as many tips, hints as well as ideas for self-made clue, clay and colours can be found in the section Special Activity 2012. Grassroots actions rather than unfruitful negotiations: "ZOOM – Kids on the Move" demonstrate to politicians and the adult public worldwide that they do not accept empty promises. They cannot be prevented them from contributing personally to climate protection. Children between four and twelve years of age may participate in the 2012 campaign actions weeks. 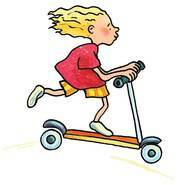 "Kids on the Move" travel climate-friendly by foot, bike, roller-skates, bus and train etc. in their daily life and collect "Green Footprints" for a better global climate. Each journey travelled by sustainable means counts as one Green Footprint. Climate Alliance will hand over the footprints collected all over Europe to the participants at the United Nations Climate Conference in the Emirate Qatar at the end of the year. 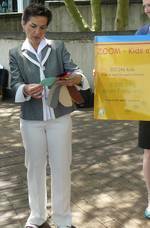 On Wednesday, 30 November, Climate Alliance handed over 2.7 Million “Green Footprints” collected by 200,000 children in 25 countries to UNFCCC Executive Secretary Christiana Figueres in Durban. 201,146 kids from 16 European and further nine countries (Austria, Belgium, Cocos Keeling Islands, Czech Republic, Denmark, France, Germany, Hungary, India, Indonesia, Italy, La Reunion, Luxembourg, Malaysia, Malta, Mauritius, the Netherlands, Poland, Romania, Singapore, Slovakia, Sweden, Switzerland, Tanzania, Thailand and the Ukraine) ZOOMed in and together collected 2,710,340 “Green Footprints” by using sustainable means of transport for their daily journeys, by saving energy in their schools and kindergartens, and by eating regional food. On Wednesday, 30 November, Climate Alliance will hand over “Green Footprints” collected by 200,000 children in 25 countries to UNFCCC Executive Secretary Christina Figueres at the Climate Summit in Durban. Coming Wednesday, Thomas Brose, Director of Climate Alliance, shall hand over the Green Footprints to UNFCCC Executive Secretary, Christiana Figueres, on behalf of all participants. He will be assisted by representatives of ZOOM participants from Austria, Germany, Luxembourg, the Netherlands as well as the Swiss circumnavigator Dario Schwörer from TOPtoTOP. The full Press Release as pdf (60 kb) you find here. The ZOOM Campaign explained in a short film powered by astramedia can now be seen in our Home section. Climate Alliance is very pleased with the result and wants to thank all those being involved!